This means the 2 HG's that will be evicted tomorrow, will be the first 2 HG's on the BB15 Jury! Wow, a 9 person jury this season..that's huge! Just to get everyone caught up to speed (in case you didn't read the Overnighter yet), it looks like Candice will most likely get evicted tomorrow during the Double Eviction live show. I don't expect this to change between now & then. The HG's, while they suspect a D.E. tomorrow, don't know for sure that it will be. Helen told GM this morning that she's gonna change the sheets on "GinaMarie & Nick's bed" for her, since she was so upset last night about Helen/Elissa sleeping in Nick's old bed. Around 10am BBT, Helen/Amanda talked about getting Judd out soon. Helen said if she wins HOH, she's gonna put up Judd/Jessie & wants Judd to go home. In case you're wondering when the McCranda BB Wedding will take place, that's supposedly gonna happen next week. *BY couch crew are talking about the HOH endurance comp last week. *Inside, Jessie is making breakfast for everyone. Elissa is in the kitchen as well, complaining that BB doesn't give them greek yogurt, just cottage cheese. Sidenote: GM's HOH Blog is now up. Feeds have been fishies for a little bit now. Helen/Judd are going back & forth about Jessie campaigning for Candice and how Candice campaigned harder for Howard than she has for herself. Judd/Helen are talking about Jessie. Helen thinks Jessie is "crazy" & how she'd never put up Judd because she's in love with him. Helen said that Jessie thinks she's playing the game with Judd. Judd: "I'm not playing in duos. This isn't a duos season." They're talking about how Aaryn does not wanna play the OTEV veto comp because she doesn't wanna get pushed/tripped/fall during that comp because it's so competitive. Judd: "I'll do whatever it takes to (win the Otev comp)." Aaryn: "People always get hurt in it, and I don't want that." Helen: "Otev is scary looking." Aaryn is asking Helen if Jessie told her that Amanda wants to backdoor her. Helen says no & that she didn't hear that one. Meanwhile, Judd & Andy are talking in the Lounge Room. Andy said people keep saying who they would nominate if they won HOH but he (An) isn't gonna tell people who he'd get rid of, so that if he doesn't win HOH, then he won't have those people gunning for him. Judd is telling Andy that he'd never date Jessie outside the house. Aaryn: "It's making me nervous." Helen thinks Judd wants Amanda out of the house so that him/McCrae can play together. Helen says how "dangerous" that'd be for Judd/McCrae to play the game together. Helen: "That's why he can't get Amanda out right now. If Amanda leaves, McCrae's game gets that much stronger." Andy re-joins. Talk is about blisters on feet. Jessie is in/out of the house. Amanda/Elissa are talking non-game chit chat in the bathroom. Current topic is about children being born into families that don't want them (for various reasons). Feeds go to fishies when Amanda starts to tell a story about someone she knows. Andy/Helen/Aaryn are talking about Nick & GM. Helen hopes he loves GM because otherwise, GM is gonna be crushed. Andy doesn't think he is. Aaryn: "She's gonna be devastated." Helen warns Amanda that people think they're all working together & are gonna try to get them out. 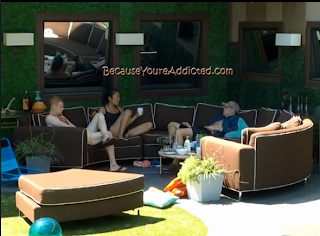 Amanda/Helen/Andy are talking about how Judd is the MVP & is trying to convince others that the MVP is Elissa. Helen said she thinks he's the MVP & that he (Judd) has nom'ed Amanda the past couple of weeks. They think Judd is trying to turn" them" against McCrae/Amanda. Helen tells Amanda that Judd wants Amanda out because he (J) wants to work with McCrae. Amanda: "McCrae would never work with (Judd). He's too shady." Talk is about how they wanna put up Jessie/Spencer and if one of them comes down, then they'll backdoor Judd. Then again, most people don't understand grammar or spelling these days. In the eyes of the 14 year old girls BB was targeting this season, GM actually did great! Go BBVX...or XV...oh who cares about Roman Numerals anyway, we're in 'Merica! Does anyone know how MVP will work with Double Eviction?? Okay so I just read GM's HOH blog and for starters I feel like a lost a few IQ points just reading it! Secondly, What in the world did Nick do to her that I missed, because she is freakin' delusional!!! It's almost scary the way she talks about him. I'm from the south, so the only thing I can really say is... Bless Her Heart!!! GM is unraveling faster and faster. She is acting like a lovesick 12 year old...not a 32 year old woman. What kind of voodoo did Nick do on her?? She is a fruit loop!!! Do the HG find out before the first eviction that it's a double eviction? no, they'll find out during the live show. Julie will tell'em. hmmm...I wonder if that will change the vote? Maybe a little too late though. OK - I couldn't stop myself and read GM's blog (first one I have ever read LOL) - She's right - she is a really bad writer and speller - eeegod! And I think the whole Nick thing might now be over the edge. I don't see the live feeds - was there a lot more between them than I think? Nick seems to be the first guy GM was attracted to that didn't use, abuse, trash, then throw her away, so that means it must be love. I refuse to make fun of GM's writing. While in school, nobody taught me how to write. I was in advanced classes in math and science, but I failed 10th grade English. I had to teach myself how to write after I got out of high school. And I did teach myself. I did so well on college placement exams that the proctor was shocked by my score (99). I nailed A's in composition, and the professor kept one of my essays (with permission) to use as an example for future classes. Remember, however, that I was self-taught and struggled to learn to write. Before I put concentrated effort into it, I could barely write a sentence in spite of high IQ and otherwise excellent education (not to mention my voracious reading habit). Some people are highly deficient in math and science when they come out of school (you know who you are). Some are deficient in English. Not everyone can be great at everything. Give the girl a break. She cried because she knows she did poorly with grammar and spelling and was embarrassed. That's so much more consideration than MOST Americans give to their English language skills. These people are clueless on how to play this game. Clearly Judd is not the MVP he was also not willing to go against Amanda so why would he nominate her? Also McCrae will become stronger without Amanda? HA HA HA! I'm not 100% what he would even be like bc unfortunately we have not been able to see really anything. I wish he would get sick of Amanda but he's so whipped that will never happen. Why can't these people get their S*hit together and vote out Amanda? It's so frustrating. I hate this season! While I think this season has been slow so far, I really think that the double-eviction could be just the thing we're looking for. There will be no time to collude once the new HoH goes up, and that will definitely be the time to make a move on some of the stronger players in the house. My take on the HG. Helen - Is over playing. She needs to listen to Elissa and stop trying to eliminate people who are not against your game. Once she eliminates Candice, Jessica and Judd who will she have left besides Elissa to keep her in? Elissa - I like her because she is not as phony as everyone else. She doesn’t pretend to like someone if she doesn’t like them. She is trying to think about her game and in the beginning she wasn’t afraid to make big moves. Helen is cramping her style. Andy - Who is he? Amanda's shadow! Aaryn - Young minded and mean spirited. Candice - She doesn't know how to play the game. It is sad to see people in the house hate her with a passion but why? They keep calling her a time bomb. And Amanda isn’t? If she would have played it cool and not confront Spencer in front of everyone and ruin is plan, Howard would probably still be there today. Amanda - She is a great manipulator and she has two very loyal people by her side: her shadow Andy and McCray. Because of some of the crude things that have come out of her mouth, she cannot win Big Brother. I won’t allow it. IJS. McCray - I would like to get to know him more but he is being over shadowed by Amanda. Seems like a decent person. He didn’t have Amanda would he still be in the house? He probably would have just been a floater. Spencer - I have nothing bad to say about him. He is trying to play the game. GM - She is very unpredictable. She does things and you can't figure out why. Like, why is she in love with Nick? Does she really think Nick is in love with her? Why does she hate Candice? Why are you against Jessie? Is she delusional? Does she hear voices in her head? Jessie - I love the fact that she is growing some balls. Judd - He is like Helen… Over playing the game. He is in an alliance with everyone. And I don’t like him being such a douche bag to Jessie. Not a sign of good character when you lead someone on. But maybe they both are playing each other. Wow!! GM is sad and insecure. I won't make fun of her inability to write or spell it goes w/out saying, but if she's so concerned with people thinking she's stupid maybe she should close her mouth and open a book!! Focus less on a relationship that never was and hair dye and start working on that personality/character. I find it extremely hard to feel compassion or identify w/GM she goes from victim during the day and back to calling people the c-word at the end of the night. I just can't wait to see the BlondeBigots faces when they learn about the 9 person jury...Ha Ha!! You must only watch the shows on CBS. I disagree with 90% of your post, especially about Spencer. You can't find anything bad about Spencer??? Yikes! Debbie, I was thinking the same thing. I'm hoping they arrest him right out of the BB house. Thanks Rebecca. Her behavior is sometimes terrible, and she clearly has emotional issues, but she is painfully aware that her writing is sub-par. We can all be better people by taking to heart the kindness of your words.